Read our 2001 interview with spy mom Carla Gugino! Smart filmmakers of kids' movies know they'll be seen more on video than in theaters, and direct so the films will be just as good in both formats -- and Rodriguez is a smart director. Getting by on little more than its contagious charm, "Spy Kids 2: The Island of Lost Dreams" has about three-quarters the fun of its spry 2001 predecessor -- but it's a rushed, slapdash, sequel-for-the-sake-of-a-sequel with less than half the plot and ingenuity. 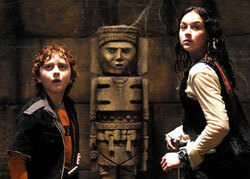 Taking place some time after the cartoonish espionage adventures of the first film has lead to the creation of a Spy Kids division within the OSS (what that stands for goes unexplained, even in the press kit), Part Two picks up in the middle of a rivalry between hero spy kids Carmen and Juni Cortez (Alexa Vega and Daryl Sabara reprise the roles) and impudent, bratty upstarts Gary and Gerti Giggles (Matt O'Leary and Emily Osment). The Giggles horn in on the Cortezes' rescue of the U.S. president's equally bratty daughter (Taylor Momsen) from an wild amusement park ride run amuck in the movie's opening scene, then get assigned to a coveted mission by their father Donnagon Giggles (Mike Judge, creator of "Beavis and Butthead"), a crooked agent who is appointed OSS director over Carmen and Juni's father (Antonio Banderas). What this mission involves goes largely unexplained except that it has something to do with a device Donnagon wants to steal called the Transmooger, which can render all electronic gadgets useless. Also a cloaking device, the Transmooger is currently being employed by a mad scientist named Romero (Steve Buscemi) to conceal his secret island of weird genetic experiments. Both sets of spy siblings make their way to the island in brightly-colored, super-gadget-packed, dragonfly-shaped submarines -- which break down as soon as they're in range of the Transmooger, leaving all the kids to depend on their wits as they face each other and the island's giant, cross-bread, computer-animated critters. Parents old enough to recognize the influence of stop-motion animation master Ray Harryhausen ("Jason and the Argonauts," "Clash of the Titans") might enjoy these intentionally crude computer-animated creatures (a spider/monkey, a horse/fly, etc.). But the film's target audience -- kids raised on post-"Jurassic Park" CGI -- will likely find them conspicuously fake-looking. Rodriguez (who also served as the film's editor, composer, director of photography and production designer) infuses "Spy Kids 2" with enough spirit and vitality to shrug off its shortcomings -- although that requires some willpower because they just keep coming and coming. Chunks of story were either randomly grafted into the narrative (Carmen and Juni pass through a cave that makes them telepaths for about 60 pointless seconds) or left on the cutting room floor (why is Cheech Marin's Uncle Felix suddenly a bad guy?). Continuity problems abound (sometimes the island is lush and green, sometimes it's desert -- often in the same scene). I could go on and on. While 13-year-old Vega and 10-year-old Sabara still have great sister-brother chemistry as our hero spy kids, their characters seem to take no joy in their gadgetry and adventure anymore. When they click their heels together to ignite their cool rocket shoes, they do it with ho-hum looks on their faces, almost as if they're sick of their jobs. And the movie's finale is contrived, simplistic and even a little silly (most of the cast stands around watching while two characters duke it out). In fact, the best scene in the picture is the amusement park opening, in which the gung-ho owner in a 10-gallon hat (Bill Paxton) introduces the president's daughter to rides like The Whippersnapper (throws riders around like they're at the end of a bullwhip), The Vomitizer (spin, spin, spin!) and The Juggler (riders get inside giant balls that are tossed and spun in the air by a robot). The worst scene is the staged, Britney Spears-styled "concert" footage that accompanies the closing credits, in which Vega lip-syncs and shakes her booty to an innocuous pop ditty written by Rodriguez. It has nothing to do with anything except scoring soundtrack airplay on Radio Disney, which is a corporate cousin of the movie's distributor, Dimension Films.